Stuttgart and Ludwigsburg, Germany – In 2017, Bosch achieved a strong 6.7 percent increase in sales. According to preliminary figures, the supplier of technology and services generated sales of 78 billion euros last year. Adjusted for exchange-rate effects, that represents an increase of 8.3 percent. Sales results were negatively impacted by exchange-rate effects to the tune of some 1.2 billion euros. “We exceeded our growth forecasts and further improved our profitability. 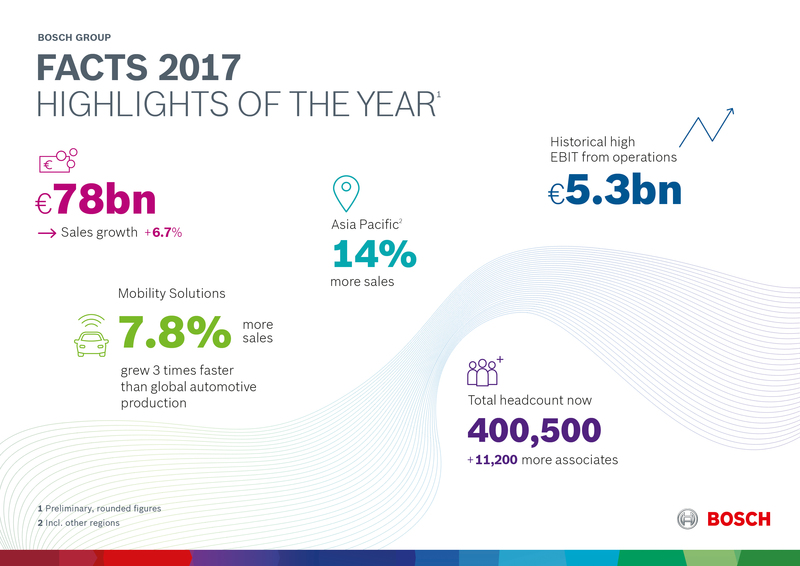 In 2017, our sales were higher than ever,” said Dr. Volkmar Denner, chairman of the board of management of Robert Bosch GmbH, speaking at the press briefing on preliminary figures in Ludwigsburg, Germany. As a result of its innovative strength and a strategy focused on connectivity, the company remains on a growth trajectory. As Denner explained: “We recognized the potential of connectivity early on and are now converting it into business success.” Earnings from operations before interest and taxes (EBIT) rose to some 5.3 billion euros in 2017. This equates to an EBIT margin from operations of 6.8 percent. As Professor Stefan Asenkerschbaumer, the CFO and deputy chairman of the board of management, explained, “Bosch’s success in its core business finances its efforts to become a leading supplier of IoT technology and mobility solutions.” Looking at the year ahead, the company sees numerous opportunities to bring connectivity to further areas, such as factories, buildings, and cities, as well as to transform mobility. Denner also stressed the importance of transforming corporate culture for the digital transformation. Denner said that connectivity and digitalization have become part of day-to-day business at Bosch, where they are firmly anchored. “The transformation provides us with a further opportunity to show that excellence is not only something that exists on paper at Bosch, but in practice as well – in both a technological and a commercial sense.” Bosch sees tremendous sales potential in connected industry, or Industry 4.0. A new operating unit, Bosch Connected Industry, began operations with 500 associates at the start of January 2018. It is here that Bosch will pool all its Industry 4.0 activities and expertise, especially concerning software and services. Going forward, Bosch will also contribute its expertise in Industry 4.0 implementation to an advisory service for third parties. Between now and 2020, the company aims to exploit Industry 4.0 to increase sales by more than a billion euros. Having acquired a stake in the map provider HERE, Bosch will be able to unlock further potential for projects in the Industry 4.0 domain. Denner emphasized the importance of connectivity over the internet of things: “Our planet can only provide a livable home to billions of people if we find innovative solutions to pressing issues.” Bosch currently has some 170 IoT projects that address fundamental challenges such as population growth, urbanization, air pollution, and climate change. “We use the internet of things to connect the real world in a bid to improve quality of life,” Denner said. In 2017, for example, the company introduced new solutions for smart farming, or connected agriculture, which it is hoped will help feed eight billion people by 2025. Here, sensor-based solutions and artificial intelligence are being deployed in the cultivation of asparagus, strawberries, and tomatoes. Bosch technology is also helping achieve greater efficiency and sustainability in oyster farming and cattle ranching. The digital agriculture market is expected to grow more than 70 percent by 2020. In response to the increasing number of mobility and IoT applications for semiconductors, Bosch is building a wafer fab in Dresden and intends to invest more than a billion euros in the new facility by 2021. Among the areas of application for these chips are smart homes. For the smart kitchen, Bosch will offer not just connected household appliances, but an increasing number of digital services as well. Its Home Connect ecosystem incorporates an app provided in twelve languages by the Kitchen Stories start-up. The app, which has already been downloaded more than 15 million times, contains over 1,000 recipes and uses videos or photos to demonstrate how to prepare them. At CES in Las Vegas at the start of the year, Bosch introduced its comprehensive portfolio for connecting entire cities. Among its offerings is the “Climo” mobile air lab, which provides data on city air quality in real time. 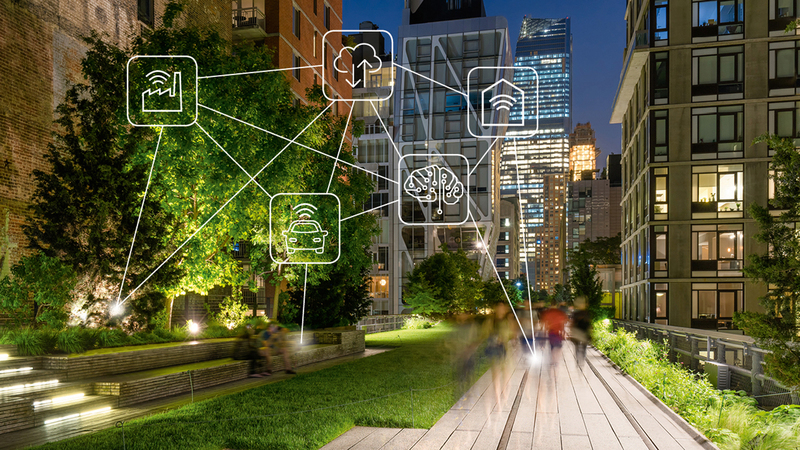 By 2025, 80 of the world’s metropolises will be smart cities, and even now, Bosch is pursuing 14 beacon projects in this field. The smart-city market will grow to 700 billion euros by 2020. Urbanization goes hand in hand with a multitude of problems. Urban traffic will triple by 2050. “We want to achieve urban mobility that is emissions-free, stress-free, and accident-free. To that end, we will automate, electrify, and connect road traffic,” Denner said. Starting this summer, the COUP sharing platform is bringing its e-scooters to the streets of Madrid. Automation, too, will help relieve the burden of urban traffic – by the start of the coming decade, Bosch and Daimler will make fully automated and driverless vehicles a reality on city streets. The first test vehicles will be on the road as early as 2018. Bosch and Daimler also moved one step closer to automated driving in 2017: in the Mercedes-Benz Museum parking garage in Stuttgart, the companies launched the world’s first solution for a fully automated valet parking service. Denner stressed the importance and potential of the combustion engine: “It is unlikely that we will meet our CO2 targets in Europe without diesel.” Referring to the ongoing discussion about driving bans on diesel vehicles, Denner pointed out that efficient and resource-conserving diesel technology already exists. And not only that: “Our test vehicles meet 2020 limits even today. We are already developing and testing systems that are actually well below these limits,” said Denner, whose responsibilities include research and advance engineering. Bosch engineers have an ambitious goal: to design a combustion engine that “breathes out” only what it “breathes in.” With the exception of CO2, its emissions should be indistinguishable from the ambient air. When powered with synfuels, such engines would even be carbon-neutral. All business sectors played a role in the positive development of the company’s business in 2017. According to preliminary figures, sales in Mobility Solutions rose by 7.8 percent – three times faster than global automotive production – to 47.4 billion euros. Adjusted for exchange-rate effects, growth was 9.2 percent. This success was driven primarily by strong demand for diesel injection systems, especially from the commercial-vehicle sector, for gasoline injection systems, as well as for driver assistance and infotainment systems. In the Consumer Goods business sector, BSH Hausgeräte and Power Tools increased sales by 4.5 percent to 18.5 billion euros. After adjusting for exchange-rate effects, sales grew 6.7 percent. BSH Hausgeräte in particular performed well in 2017, its 50th anniversary year. The Industrial Technology business sector saw powerful growth of 7.7 percent, with sales rising to 6.7 billion euros. This is equivalent to an increase of 8.5 percent after adjusting for exchange-rate effects, an increase that was due mainly to the Drive and Control Technology division. The Energy and Building Technology business sector achieved sales of 5.4 billion euros, which equates to an increase of 3.1 percent, or 4.8 percent after adjusting for exchange-rate effects. The Thermotechnology and Security Systems divisions won over consumers with connected solutions for heating and air conditioning, plus smart technology for building automation and security. In Europe, Bosch’s business developed very well, with sales rising 5.5 percent (6.3 percent after adjusting for exchange-rate effects) to 40.7 billion euros. One of the reasons for this was continuing growth in western and central Europe. In North America, the technology and services company’s exchange rate-adjusted growth there was on a par with the previous year. Sales totaled 12.1 billion euros, a nominal decline of 2.3 percent. The recovery in South America continued, with growth of 15 percent to 1.6 billion euros. Adjusted for exchange-rate effects, that represents an increase of 12 percent. Bosch saw strong growth in Asia Pacificand Africa, with sales rising to 23.6 billion euros. This is a year-on-year increase of 14 percent, or 17 percent after adjusting for exchange-rate effects. In 2017, the Bosch Group’s workforce grew by some 11,200 around the world. As of December 31, 2017, the Bosch Group employed 400,500 people. Bosch hired several thousand software and IT specialists around the globe. The company expanded its workforce primarily in Asia Pacific and central and eastern Europe. In Germany, headcount grew by 3,800 associates. Bosch expects moderate global economic growth of some 2.5 percent in 2018. Overall, the supplier of technology and services sees a series of economic risks due to geopolitical developments such as the Brexit negotiations, unpredictable U.S. foreign policy, and the tensions with North Korea. Bosch assumes economic momentum will slow down, particularly in China. Despite this difficult environment, Bosch plans to further increase its sales and result in 2018 and to continue advancing its transformation into a leading IoT company and provider of mobility solutions.